offers, new classes, videos and much, MUCH more! We have a special offer for our Summer Camps – Sign up for 2 or more camps and get 10% off. For more details on the classes, you can get in touch with us. 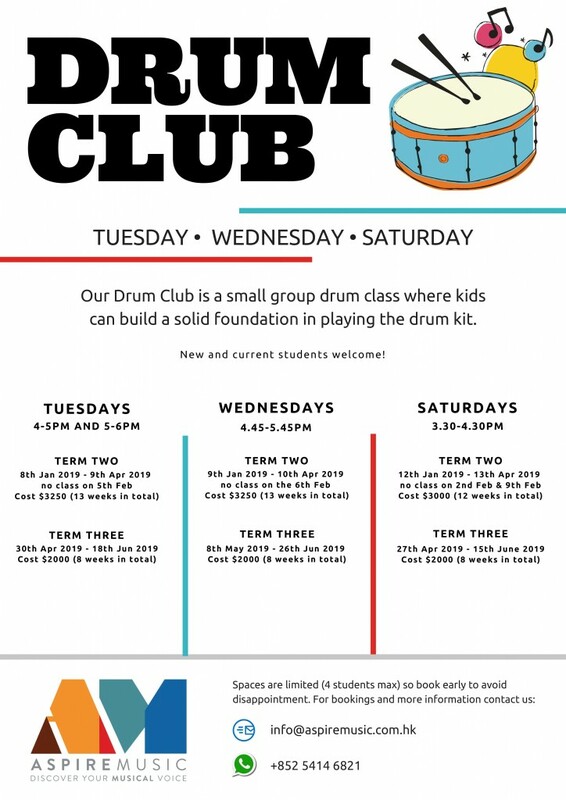 The Drum Club is a small group drum class where kids can build a solid foundation in playing the drum kit. The classes cover all the basics including hand and foot technique, simple grooves and fills, an introduction to rhythm reading and understanding drum kit notation. As students begin to master these basics, they’ll be shown how to use these skills creatively and musically in the context of a few contemporary song styles. We have a class specifically for beginners on Tuesdays at 4pm starting on April 30th. 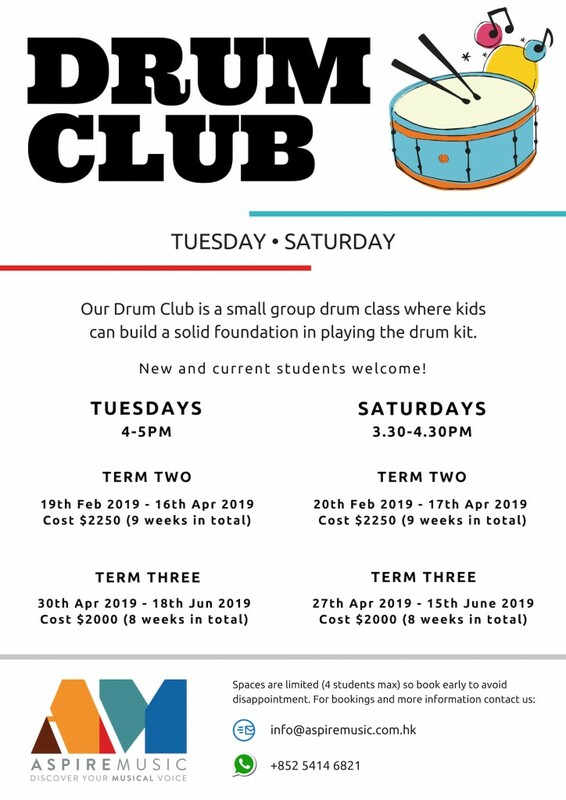 Our Saturday 3.30pm classes are for young drummers who have already completed one term of Drum Club and starts on April 27th. To book your child a spot on the course or for more information, you can contact us. 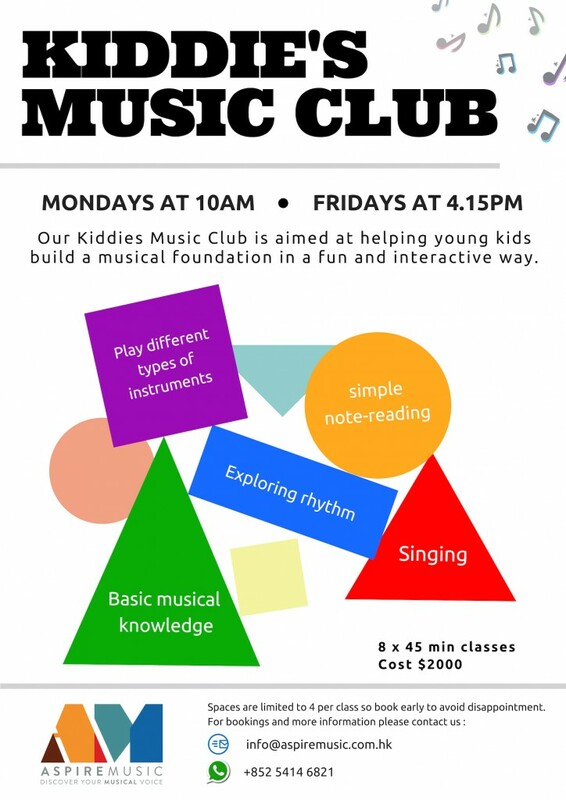 KIDDIES CLUB - EXTRA CLASSES ADDED! We’ve opened up more classes for our Kiddies Club due to popular demand! This is an 8-week course for young kids from the ages of 3-6 years. Perfect for introducing little learners to rhythm, melody and harmony using a variety of melodic and percussive instruments. Taught by our very own multi-talented and ever so lovely teacher, Devon. After completing the 8-weeks, this can be an ongoing course, running 8-weeks each time. We don’t offer a group trial for this class but if you’d like to get a taste of how the class runs, you’re welcome to book a 30 minute private class with Devon at our special trial rate of $150 before the course starts. The new class times are Mondays at 10am (starting April 29th) and Fridays at 4.15pm (starting from May 3rd). To hold a spot for your child on this course or book a trial, you can contact us. 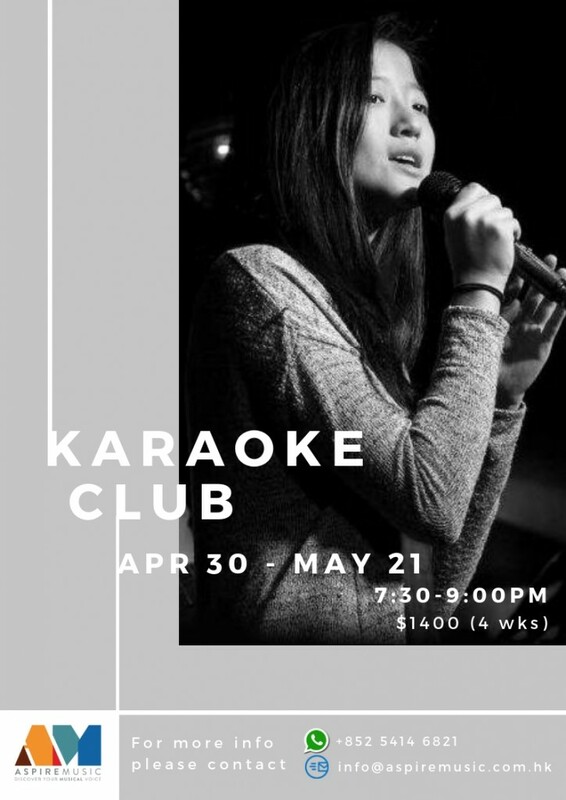 Karaoke Club is a group singing class for adults! 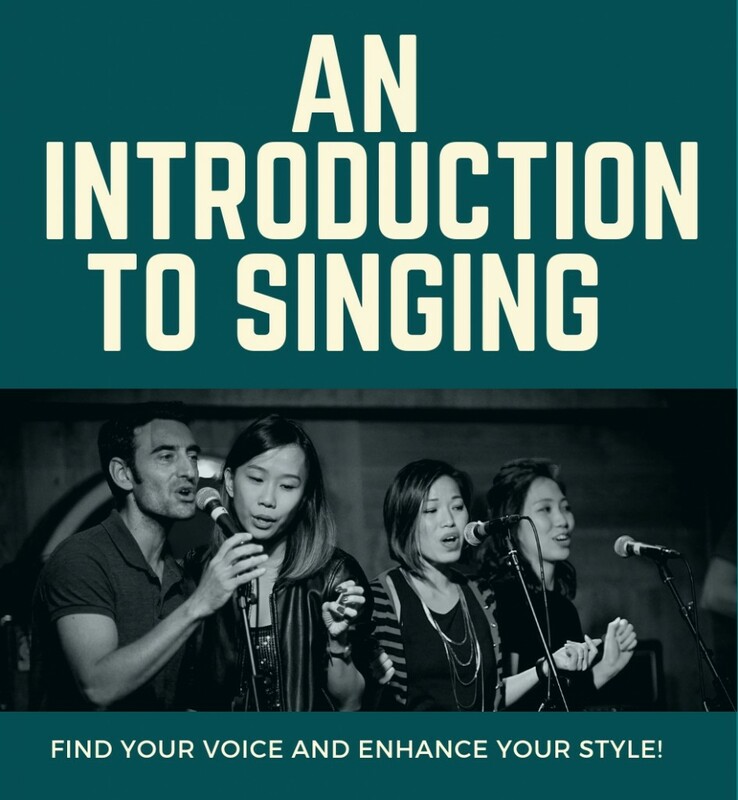 Learn to sing your fave songs with style in this 4-week course. 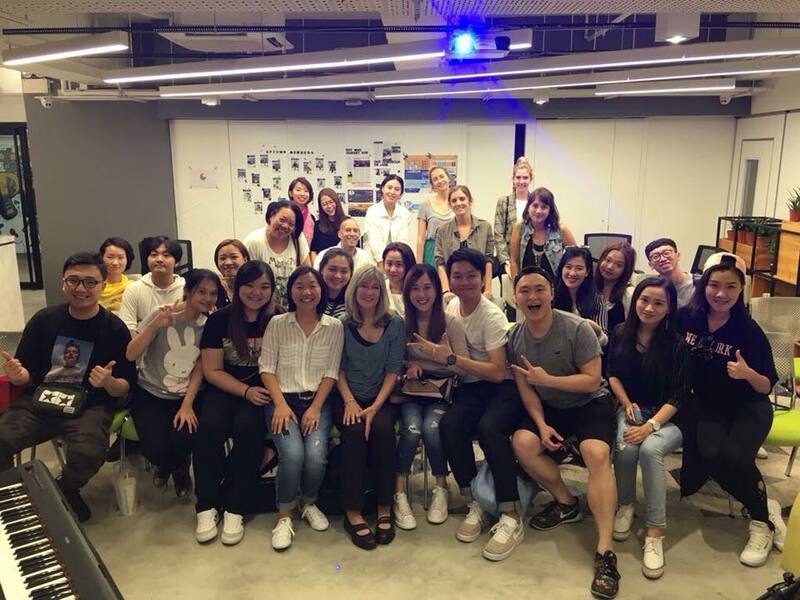 Students will get the chance to explore and practise their vocal technique but more importantly, learn songs in a fun and relaxed environment. This is perfect for anyone new to singing or who would like to continue developing their singing skills and repertoire. The course will take place every Tuesday at 7.30pm until 9pm from April 30th until May 21st. To book your space on the course or for more information, you can contact us. Drums @ Wong Chuk Hang! It’s been a crazy 2.5 months trying to swiftly move from one studio to another but we are finally in! After initially having the joyful (or not so joyful) help of builders and contractors, we got down to some serious D.I.Y. We really have to give an especially BIG MASSIVE thanks to our teacher, Devon, for helping us through this challenging period. He’s really such a gem! 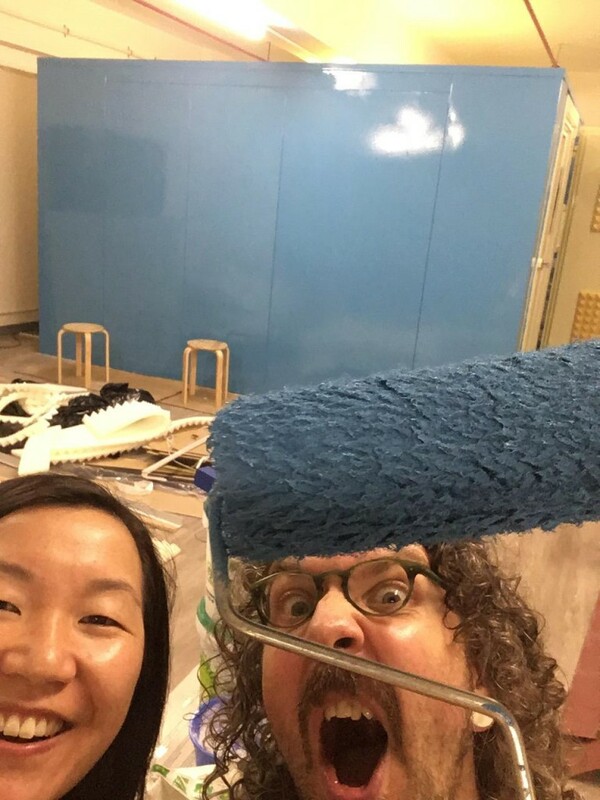 Now students can enjoy their drum lessons in Wong Chuk Hang (in the biggest space we’ve ever had), it’s really exciting to imagine how we will grow into this new space with our students. If you’re interested in having drum lessons at our new space. You can get in touch with us. The first term of Singing Club was a lot of fun and we are getting ready for round 2! Current and new students are welcome and we have 2 different time slots available – Tuesdays at 4.30pm and Saturdays at 3.30pm. For more details on each term, you can get in touch with us. Here’s an excerpt of Weisan’s original song, Rainfall, joined by Kingston on keys. Look forward to more videos from our teachers. For more information on our lessons, you can get in touch with us. We are so happy to launch our Drum Club throughout the new school year! 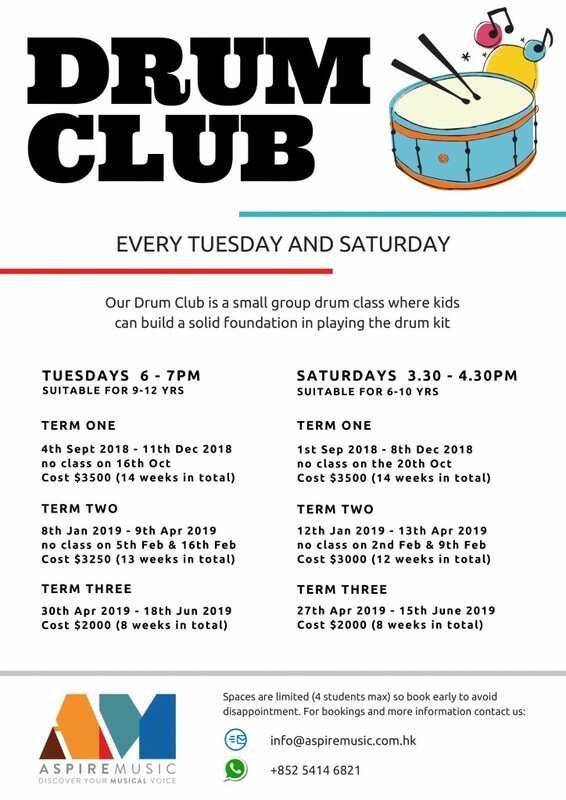 The Drum Club is a small group drum class, no more than 4 students per class, where kids can build a solid foundation in playing the drum kit. During the 3 terms, we will cover all the basics including hand and foot technique, simple grooves and fills, an introduction to rhythm reading and understanding drum kit notation. As students begin to master these basics, they’ll be shown how to use these skills creatively and musically in the context of a few contemporary song styles. Just as all her students do, Weisan works hard all year to improve and develop her skills. All this work paid off last month when she passed her IVA Level 3 exam to become a Certified Level 3 Instructor. Not only that but she was also given the honour of becoming the IVA Representative for Hong Kong… double whammy and double congratulations!! Well done Weisan. 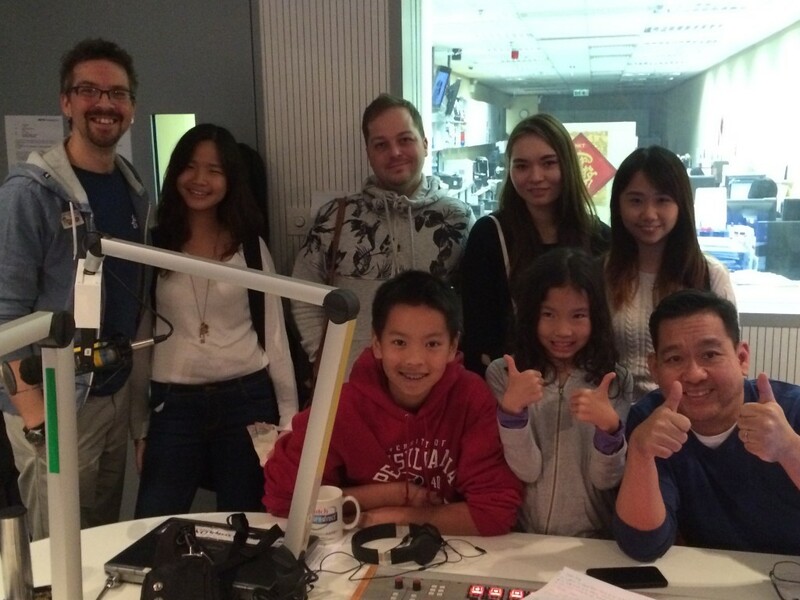 Saturday 14th November was a memorable day for these 5 lucky Aspire students as they were invited to join a tour of the Metro Broadcast Radio Station in Hung Hom. Programming Director Michael Vincent was a very welcoming and knowledgeable host and gave the students a really interesting behind-the-scenes look at how a major Radio Station operates. Once the tour was over, Michael dropped a bomb-shell on our students….. that he wanted THEM to PERFORM on the Metro Plus station!!! For a limited time, we are offering 30 minute trial lessons in all instruments from only $150! Get in touch now to book yours. This offer is only available to new students. 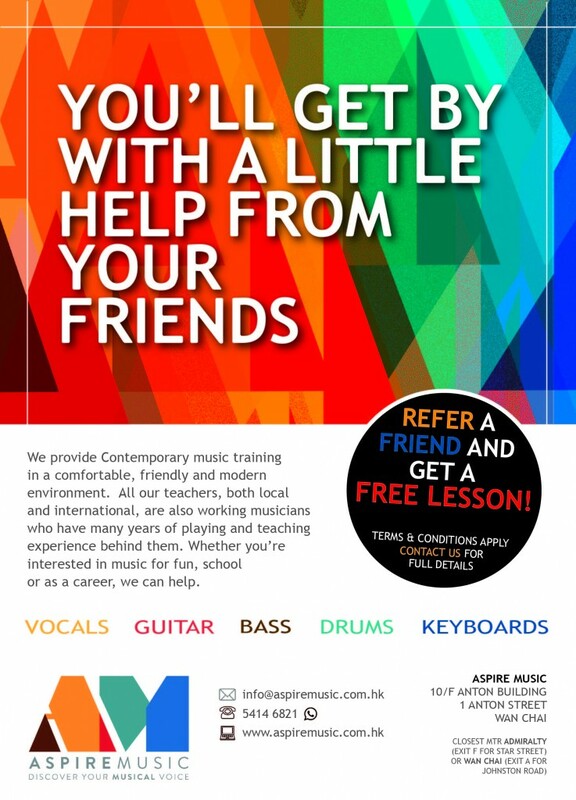 If you’re looking to treat someone special to some music lessons, look no further! 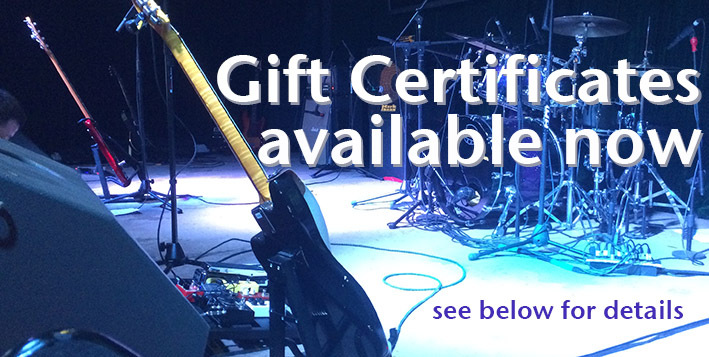 We have gift certificates available for all instruments. Give us a shout for more information. 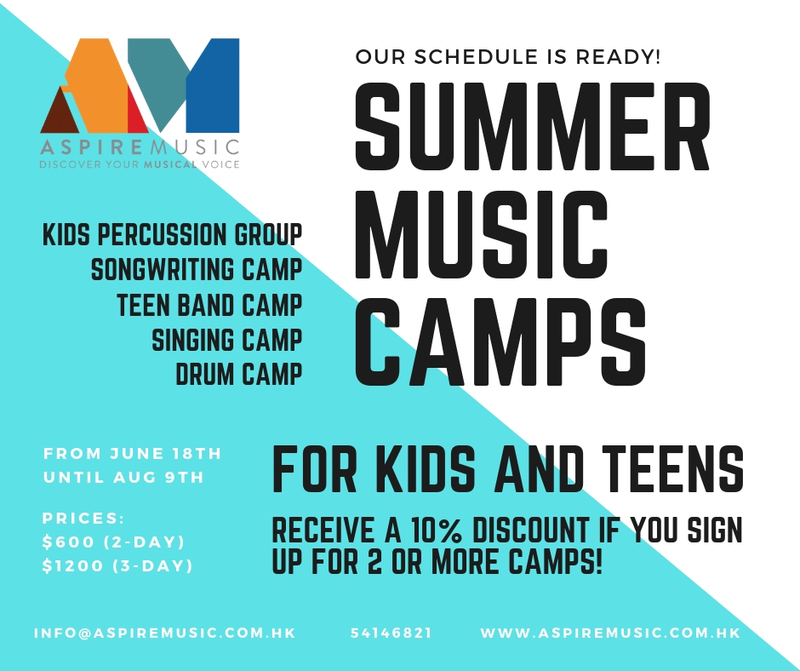 We have a variety of 2 and 3 day music camps ranging from Teen Band Camp, Songwriting Camp, Drum Camp, Singing Camp and Kids Percussion Camp. You can get in touch with us for the full schedule and details. 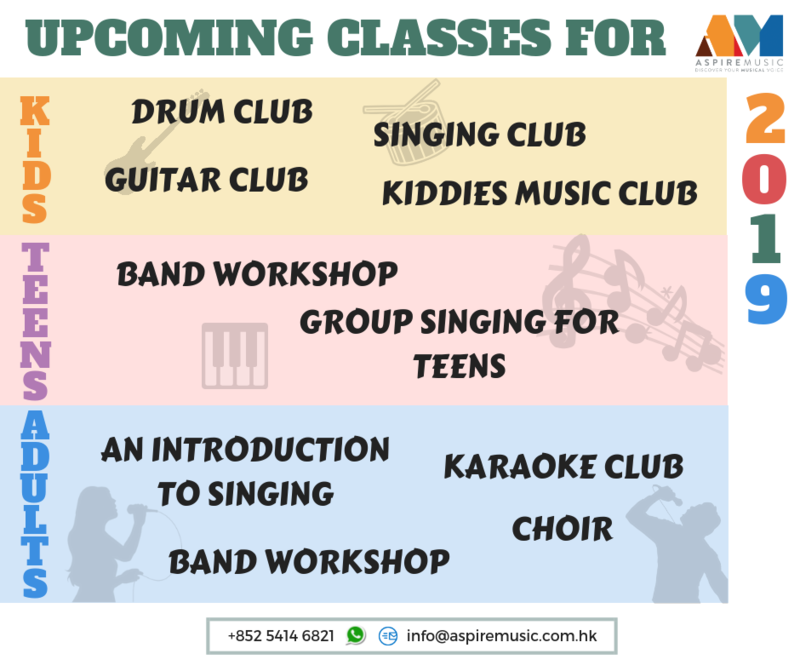 This group singing class for teens is perfect for any teenager who loves to sing and is keen to learn the craft. Expect to do this through building a solid, healthy and balanced vocal technique, developing musicianship and learning how to sing harmony as well as lead parts to their favourite contemporary songs. Learning in a group can be just as rewarding as having one-to-one sessions – You can benefit from watching, hearing and singing with others as well as yourself and enjoy the support of your fellow classmates. We’re sure this is a definite confidence builder! Classes take place on Wednesdays at 5.30pm and the next term starts on May 8th. To hold your spot or for more information, you can contact us. This choir is for adults! Relieve your stress mid-week and have a laugh with us while learning some cracking, contemporary tunes. We like to learn as many tunes as possible before going out to perform them at our resident elderly home visit or a local music venue. We’re usually tuning ourselves up every Wednesday at 7.30pm until 9pm. The next term starts on the 8th May until 26th June. To hold your spot in our choir or for more information, you can get in touch with us. Our Band Workshop for adults is back again for 6-weeks from the 4th May. This course gives students the chance to build not only their skills in playing, but their confidence in playing with others and performing live. Students will get the chance to perform the songs they’ve learnt during the workshop with their new band mates! This course will take place every Saturday at 11am until 12.30m from the 4th May until 8th June. For more information on the requirements to join, please get in touch with us. Yes, we’ll be back for more choir! With all these singing classes on offer, what’s the difference between them all! Well, in choir we mainly get together to learn songs, how to blend with one another, building musicianship, learning to look beyond the music score and putting some style into what you sing. We love to go out and perform what we’ve practised so expect to have some social nights with us! Space is limited to 12 people maximimum but if the demand is great, we’ll consider expanding, so please don’t be shy and do get in touch. The next term starts on January 9th 2019, if you have any questions or would like to sign up, please get in touch. 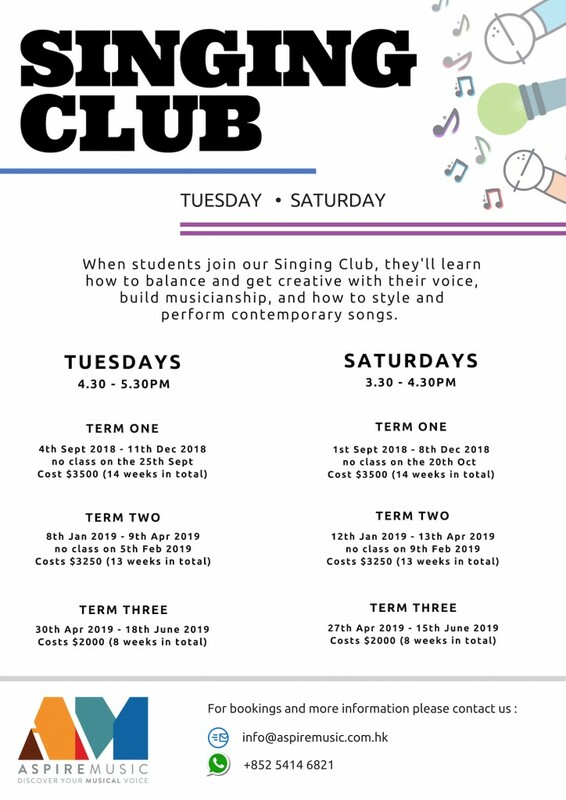 SINGING CLUB ALL YEAR ROUND! 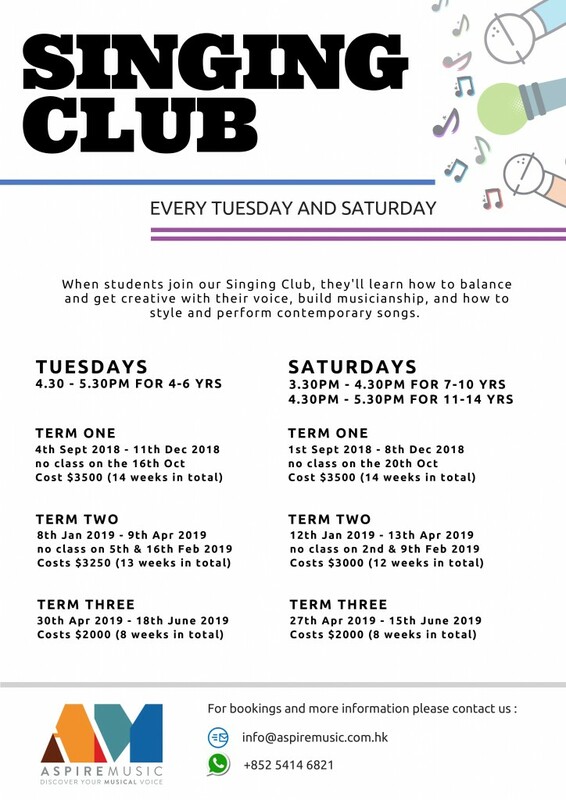 Singing Club is open to singers from the age of 6 years! This fun and nurturing group class will have kids and teens learning the importance of a balanced vocal technique, building musicianship, how to be creative with their voices, and more importantly, how to style and perform contemporary songs. Classes are taught by Weisan. To enrol in our September to December 2018 term, you can get in touch with us. We can’t believe summer is right around the corner. Each year seems to fly by quicker and quicker! 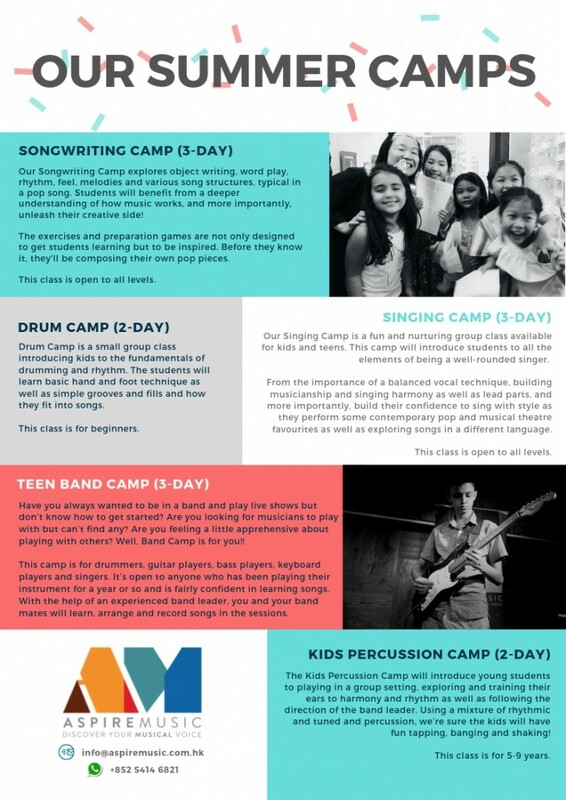 We wanted to create as many different opportunities and experiences for our students and came up with some fun and exciting summer group classes during July and August. 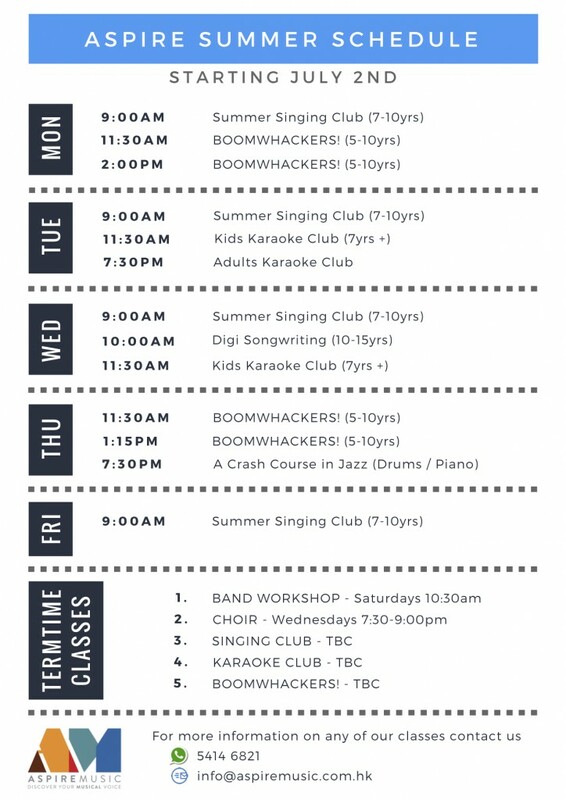 The schedule is officially ready and we hope you like what you see.There’s hopefully a little something for everyone, kids and adults, including Boomwhacker Class, Singing Club, Karaoke Club and Digi Songwriting. 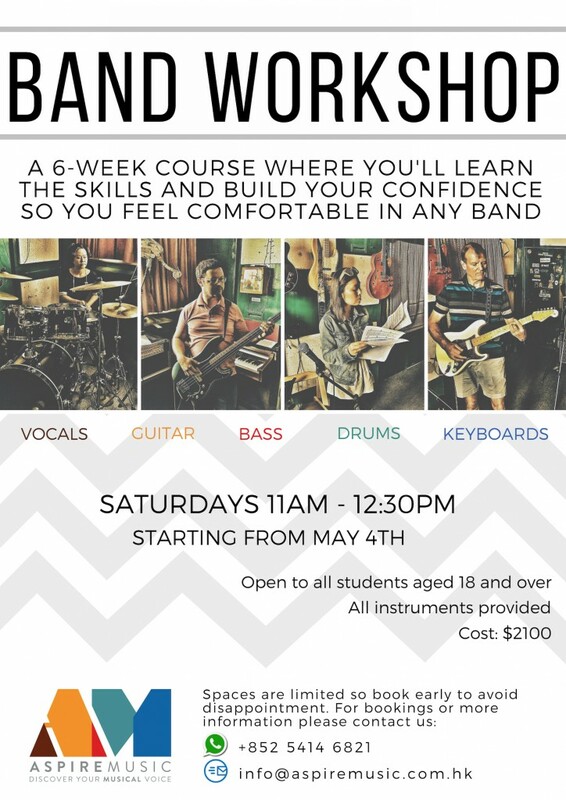 Don’t forget we also have Band Workshop that has just launched so expect more news for the next enrolment soon! For more information you can get in touch. It’s taken us a while as we’ve all been so busy, but finally, here it is… a video compilation of our students performing at our March Student Show. This was our busiest show yet, in both the number of performers and audience members, so we were delighted. A number of students are really starting to find their feet with performing and everyone did their absolute best – which is all we ask of them. Keep your eyes peeled for the next show in November 2016. A few video clips of our students performing their hearts out at our Student Show in October. We were so proud of their progress and can see their confidence building each time we challenge them to perform. Playing or singing to an audience, as well as with others, is something we believe is invaluable when you’re learning an instrument and we try to offer as many performance opportunities to our students as we can. Get in touch for details on how you can find your musical voice, and then share it with others! Calling all existing students! Get in touch to take advantage of our latest offer… refer a friend and, provided the referred student books a 10-lesson package, we’ll give you a FREE LESSON! Our drum teacher Dave’s been very busy recently… here he is with Soler at Hac Sa Beach Festival in Macau in April 2015. An awesome ‘feel’ drummer, Scott Amendola playing with the superb Charlie Hunter. Guitarists… check out Charlie’s guitar. How many strings?!?!? Singing Club is a group singing class for 7-10 years old. 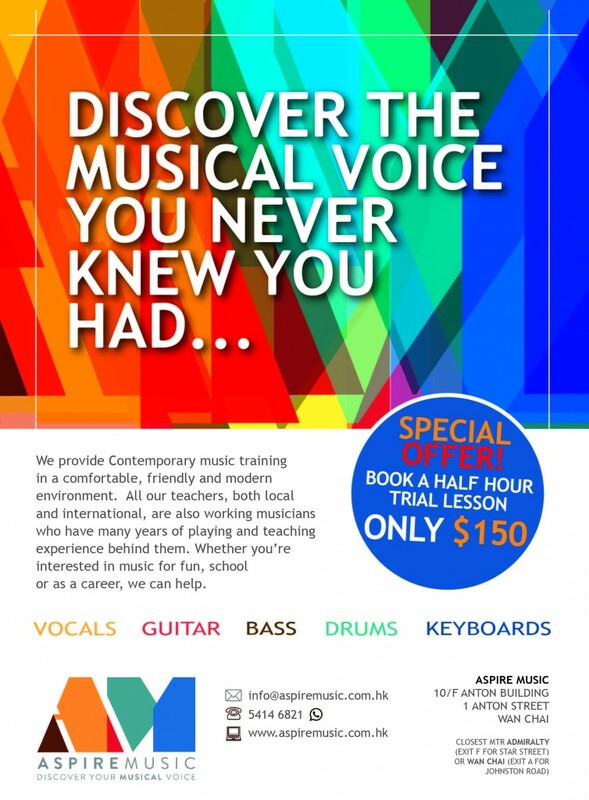 Kids will be introduced to a healthy, balanced vocal technique, develop their musicianship and learn how to sing solo as well as harmony parts to their favourite contemporary songs. There are 2 classes to choose from, Tuesdays at 4.30pm (starts on April 30th) and Saturdays at 3.30pm (starts on April 27th). Current and new students are welcome to this course. To hold a spot for your child on this course or for more information, you can get in touch with us. Singing Fundamentals is another treat for our keen adult singers! This is a 6-week course for anyone who’s looking to really hone their vocal technique and understand their voice better. Expect in-depth classes which identify the good and bad habits in your voice, you’ll be given the tools to cater to your needs and learn the ins and outs of why each tool works AND most importantly, how to apply this to the songs you love. The essentials of singing aren’t just about vocal technique, you can also look forward to applying style and learn to sing solo as well as harmony. This will be an ongoing course for students who are looking to develop and continue working on their singing skills for the long haul! 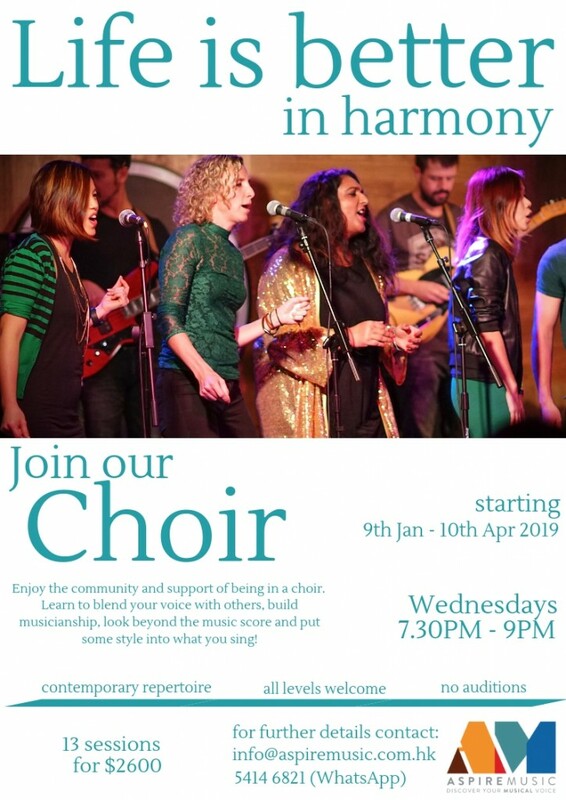 Beginners and singers with experience are welcome to join. 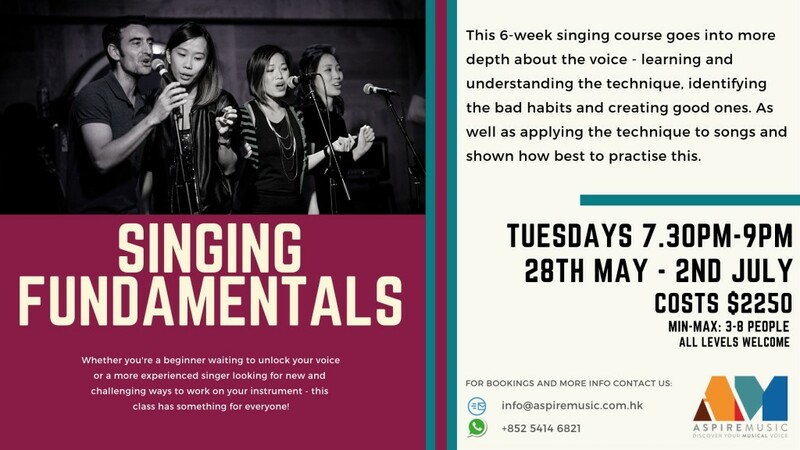 Singing Fundamentals will kick off on May 28th, every Tuesday at 7.30pm until 9pm. To book your space on this course or for more information, you can contact us. 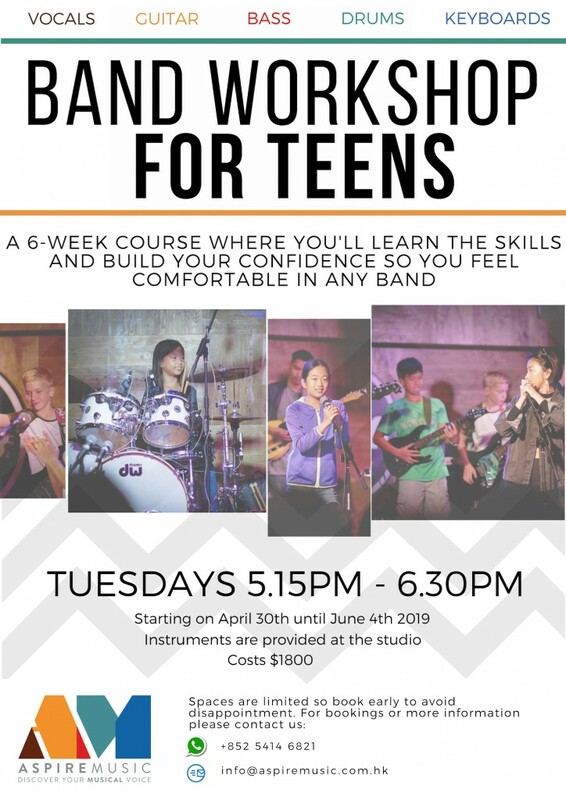 We have now opened up a Band Workshop for teenagers. This 6-week course gives students the chance to build not only their skills in playing, but their confidence in playing with others and performing live. Students will get the chance to perform the songs they’ve learnt during the workshop with their new band mates! This course will take place every Tuesday at 5.15pm until 6.30pm from the 30th April until 6th June. For more information on the requirements to join, please get in touch with us. The first term of Drum Club was such a success and we are now getting ready for round 2! Current and new drummers are welcome. Due to popular demand, we have opened up a couple more time slots – Tuesdays at 4pm and 5pm, Wednesdays 4.45pm and Saturdays at 3.30pm. This 8-week course will introduce you to the essentials for a healthy singing technique. Get to know your voice and find out how best to practise. More importantly, learn how to apply the technique to songs. 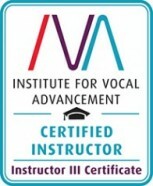 We use the Institute of Vocal Advancement (IVA) method for teaching vocal technique. Check out IVA, for more information. This course is suitable for beginners to advanced singers and starts every Tuesday at 7.30pm to 9pm from the 23rd October until 11th December. It costs $3000 for the 8 sessions. To sign up for the course, you can get in touch with us. Our Guitar Club launches and is happening throughout the school year! 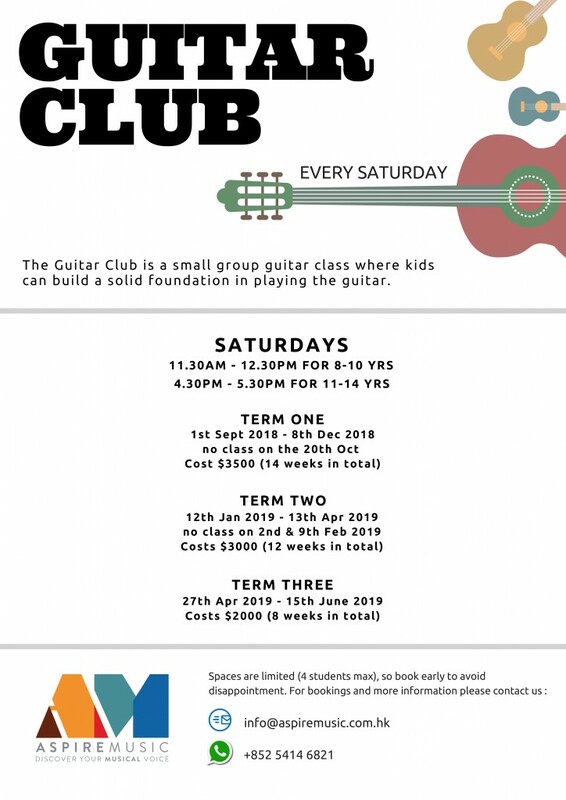 The Guitar Club is a small group guitar class, no more than 4 students per class, where kids can build a solid foundation in playing the guitar. During 3 terms, students will cover all the basic techniques including strumming patterns and finger picking, and be introduced to reading music including music scores and guitar tabs. Students will be shown how to use these skills creatively and musically in the context of a few contemporary song styles. We had the great pleasure of hosting a fantastic vocal masterclass event in November with Kathy Kennedy. Kathy is a great mentor and teacher of Weisan’s and she flew all the way from San Francisco to come and share her vast knowledge and experience with singers of all levels. The event welcomed professional performers, voice teachers as well as hobbyists. Watch this space for more events very soon! Following the Metro Radio tour, some of Aspire Music’s students were invited back to the station to record a Christmas show. They chatted, played some beautiful tunes and got into the Christmas spirit! A short photo-reel from our October 2015 Student Show. A great time was had by all and we can’t wait for the next one…. watch this space! The above video is a compilation of some of the performances from our last student show in May 2015. For many students, this was the first time they had performed live with a band and they relished the opportunity. Keep your eyes open for the next show coming in October!! We believe this sets us apart from most other music schools… we organise proper shows in proper live music venues for our students to participate in. We encourage all our students to get involved and actively try to join them together to perform with each other and – with a BAND not with backing tracks!! It could be you on-stage and in the spotlight at our next show… contact us to find out more. Here’s Dave performing on TVB with Soler in April 2015. Rock on!!! We feel it’s very important that our students are given as many performance opportunities as possible. After all, alongside regular lessons and practise, only performing can really help you to improve and build your confidence!